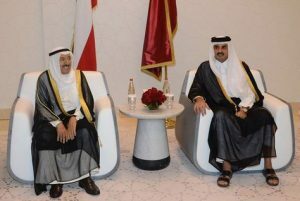 Qatari Foreign Minister Sheikh Mohammed bin Abdulrahman Al-Thani reportedly on a short visit to Kuwait handed Doha’s response to Kuwaiti ruler Sheikh Sabah Al-Ahmad Al-Jaber Al-Sabah after Saudi Arabia, the United Arab Emirates (UAE), Bahrain and Egypt agreed to extend the Sunday deadline upon request from the Kuwaiti Emir. The four boycotting countries on June 5 severed ties with Qatar over terrorism funding charges, and imposed land, air and sea blockades against the tiny Emirate. To tighten the grip, the bloc, nearly two weeks ago, issued a list of 13 demands to be fulfilled by Doha. Doha lambasted the charges and indicated that the list is made to be rejected as it targets its sovereignty. The Qatari government also indicated it would not enter in any talks unless the blockades are lifted. Saudi top diplomat Abdel al-Jubeir on Monday speaking with German Foreign Minister Sigmar Gabriel in Jeddah indicated that the bloc would analyze the Qatari response before taking any stance. “We look forward to receiving Qatar’s response to the demands in order to study it thoroughly before taking stances,” Al-Jubeir said. “The aim of the measures taken against Qatar is to change its policies that harm it, the countries of the region and other nations of the world,” he added. Qatar is requested, among other demands, to stop funding Lebanon-based Hezbollah, Muslim Brotherhood and several individuals and entities put on a terror list authored by the bloc. Doha should as well curb diplomatic ties with Iran, suspend current Turkish military deployment in Qatar and shut down the Doha-based Al Jazeera news network. As the standoff between the Gulf countries continues, the UN Security Council called the parties to solve the crisis through dialogue. “The best way would be (that) the countries concerned work out a solution through dialogue and through consultations among themselves, because we don’t see any other alternative to that,” said Chinese ambassador Liu Jieyi who chairs the council this month. “Whatever the countries can do to mend the fences and to get back to good neighborly relations, that would certainly be welcomed by China,” Jieyi added. Written by: Jaber Ali on July 3, 2017.on July 4, 2017. Posted by Jaber Ali on Jul 3 2017. Filed under Gulf News, Headlines. You can follow any responses to this entry through the RSS 2.0. Both comments and pings are currently closed.